If you believe in the power of fate, it’s hard to deny it had a hand in bringing Colin and Katherine together. 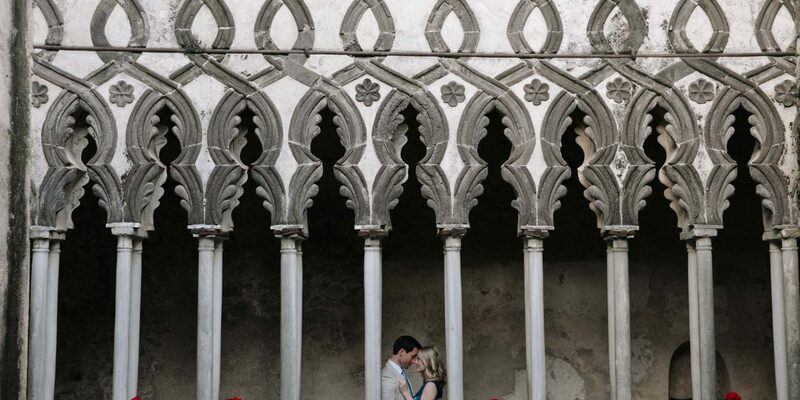 These two were truly in love at first sight and took the next step with a beautiful Amalfi Coast proposal. Read on for their story. “Katherine and I met through a thing called fate. In 2014, we locked eyes for the first time at local downtown spot The Raleigh Times in Raleigh, N.C. I was finishing up my degree from North Carolina State University, while she had driven down for the weekend from High Point University to visit friends. Regardless of how cliché it may sound, I was walking down a set of stairs and at the base of them, Katherine was sitting at a table. As soon as we made eye contact, time stood still and the rest is history. “I knew I was going to marry her right from the start. There is a saying that when you meet your soul mate, you just know. This saying held true for us, too. There is something about time spent with her that makes me the happiest man alive; just to share time with one another is what makes me feel at home. “Soon after we started dating, Katherine and I went on a trip to Quebec City. We stopped at a courtyard in front of a few dimly lit lamps all while snow was lightly falling around us. We stood facing each other, looking into each other’s eyes not saying a word for what felt like an eternity. At that moment in time, I would have gotten down on one knee and asked her to marry me right then and there only if I would have previously asked her father for her hand in marriage. “Needless to say, a few months after our trip, I asked Katherine’s father for her hand in marriage and he gave me the big ‘ok.’ I think right after our conversation I let out the biggest sigh of relief I’ve ever had in my entire life. After that, I started the plan to find ‘the girl’s best friend’ – the diamond. On a more sentimental note, I had just lost my grandmother the previous year to a tragic heart attack. Growing up, I was extremely close with my grandmother as for the majority of my childhood, she raised me. A couple months before she passed, Katherine had met her in the nursing home where she was spending her remaining days. When I last saw her, she told me how lucky I was to have found such a wonderful woman. My Nana had an heirloom engagement ring that I knew she would have wanted Katherine to have. After talking with family, we decided I would give Katherine my Nana’s ring. “In February, Katherine and I started to plan our first big trip to Europe. Katherine had an idea to take professional pictures while we were abroad and it got me thinking – what if I could turn this photoshoot into an engagement photo session? “From day one, Colin has been a romantic. 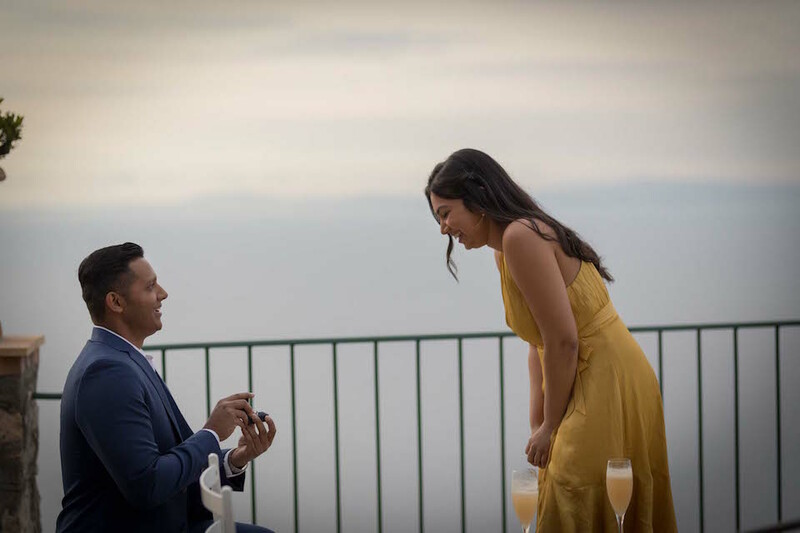 He is always thinking of ways to surprise me with adventurous dates and romantic gestures, so I knew that it wasn’t a matter of if he would propose, but how and when. We love travelling and exploring new places together. It is one of the many ways we can grow and learn together as a couple. I’m from the mountains and Colin is from the coast so we knew that the Amalfi Coast would be the best of both worlds for our next adventure. During the planning stages of our trip to Italy, I stumbled across Flytographer and thought this would be so fun and a great addition to our trip. Little did I know, Colin was making plans of his own for a proposal.